Come in and meet the team or give us a call. The first thing you’ll notice is the way you’re treated. Our founder has run our business for over 15 years with an emphasis on personal service. The first time you step into our showroom, you’ll be assisted from start to finish by our friendly, professional staff. Come down to our location and visit us today to get started with you lamp shopping experience. Contact The Lamp Connection in Stuart, FL, Today! Remember, sometimes it can be as easy as buying a new lamp or lampshade to transform a room. 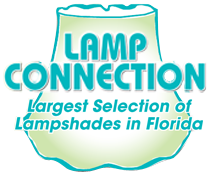 It’s simple and cheap, and if you live in Southeastern Florida, you’re close to one of the best places to shop for lamps, lampshades, and lamp accessories in the state. Come down to The Lamp Connection and see what we have to offer. From a wide selection of lamps to an enormous variety of shades and accessories, you’re practically guaranteed to find something that fits your tastes and your style. If you have something specific in mind, talk to us about it, and we’ll design and build it custom for you. Custom lamps and lampshades, as well as handmade finials and lamp or fan pulls are just a few days away with The Lamp Connection. Call (772) 221-0222 to get started!